When it comes to Blue Beetle, I’m a Ted Kord fan. Justice League International is my favorite incarnation of the JLA. The Blue Beetle/Booster Gold friendship and scams really made those two characters stand out. I wasn’t too crazy with Ted Kord taking a bullet to the head a few years ago. But since he IS a superhero, I’m just waiting for the day he “comes back to life”. 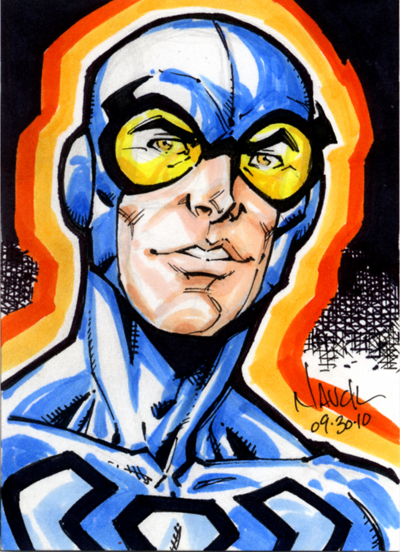 This entry was posted in DC Comics, Sketch Cards and tagged blue beetle, comics, copic, justice league, superhero, ted kord by Todd Nauck. Bookmark the permalink. Sweet, I just realized that this is the card you sent me when I ordered your sketchbook and Young Justice print.